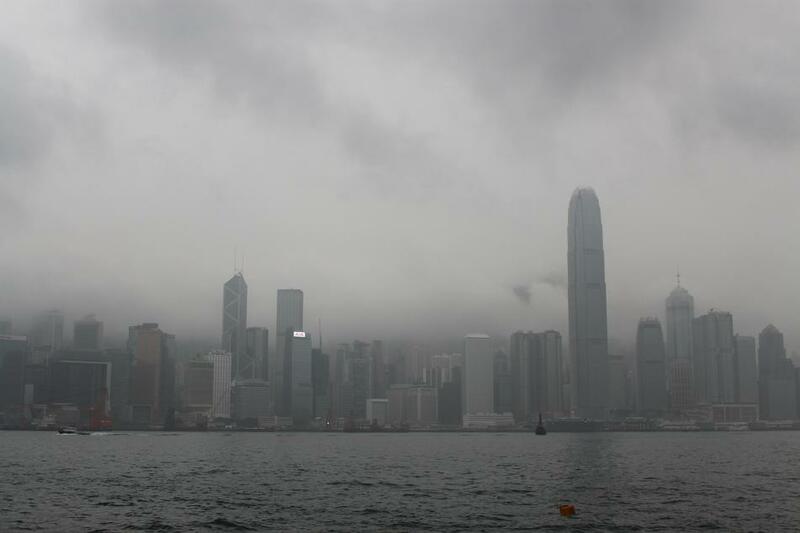 An Even Foggier Day in Hong Kong | What an Amazing World! On my second day in Hong Kong, I woke up very early in order to be able to be one of the first visitors of Ngong Ping 360 at Lantau Island (I always try to avoid huge crowd of people everywhere I go). But the sky had not gone better that morning than the previous night. Fog was still hanging low and the sky was grey. However I stuck to my plan and took the MTR to get to Lantau Island. Then after a relatively long ride, I got off at Tung Chung MTR station only to find out that it is located next to a large mall which is called Citygate Outlet Mall. Like other big cities in Asia, you can find malls almost everywhere you go in Hong Kong. It was a bit frustrating when I found out that it was drizzling at the island. But that did not stop me from going to the Giant Buddha statue by taking the cable car. 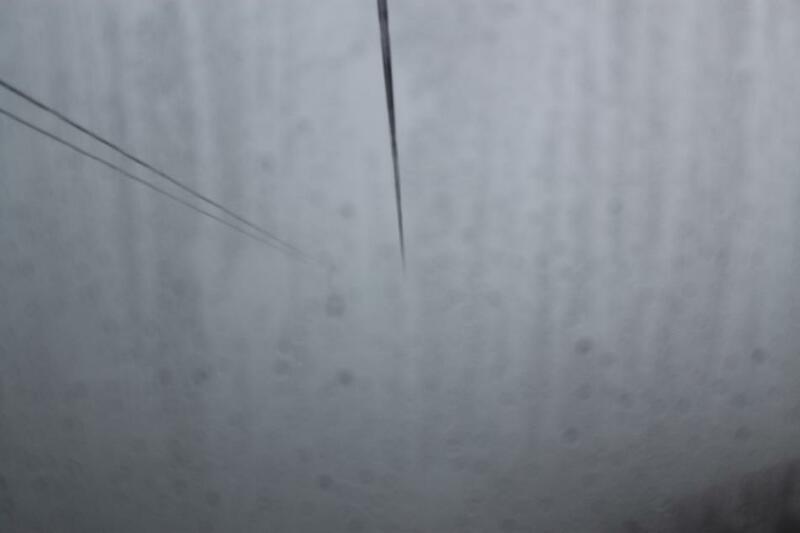 However, I had to wait for a few minutes before getting on the cable car because the weather was not permitting. The operator had to shut all the cable cars temporarily until it was safe to run them back normally. There are two types of cable cars which people can choose: the standard cabin and ‘crystal’ cabin (so called due to its transparent floor). The later costs more, that is why I decided to take the standard one. But a few minutes later my most frustrating moment in Hong Kong started. The air was severely foggy that I could not see anything, not a single thing, from the windows. What makes things worse was the fact that it was still drizzling so all the windows were covered with water droplets. I could only sit down and look at the pictures at the brochure. Perfect blue sky, green hills, a glimpse look of the airport and so on. I imagine how gorgeous it would be if there were no fog at all. Several minutes in the cable car felt like forever. When I almost got to the point of boredom, then suddenly a huge platform was already laid before my eyes and there I was, finally arrived at the terminal station. But that does not mean that my frustration had gone away. On my way to the Giant Buddha statue, I walked through a small artificial village which was obviously built up for tourists but the visibility had gone anything but better. Everything was covered by the fog. However at some point it actually did feel quite nice because the fog gave this place a mysterious atmosphere. Nevertheless, no matter how excited I was, even slightly, that did not last long. 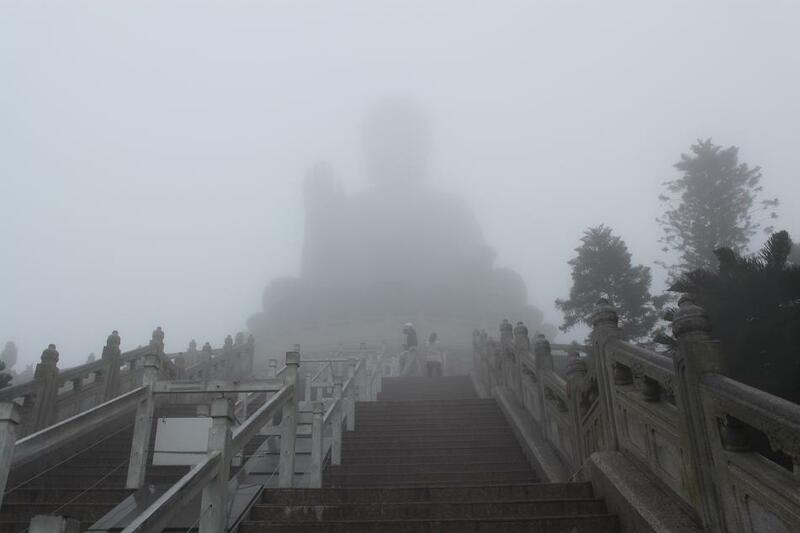 When I arrived at the bottom of the stairway that leads to the Giant Buddha, I could not see the Buddha yet. Then I went up, one step after another, asking to myself whether there is a Giant Buddha statue up there or not. I could confirm that there is actually one only after I had gone halfway to the top. But the Buddha was pretty much a silhouette. At first I thought that I would wait for half-an-hour just to wait for the fog to clear up a bit. But then I decided not to linger at that place for any longer (a decision that I will never regret because the fog got anything but cleared up). A month earlier, a friend of mine also went to this place and suggested me to go to the Wisdom Path, not far from the Giant Buddha. But she did that on a sunny day. However, I did give it a try. 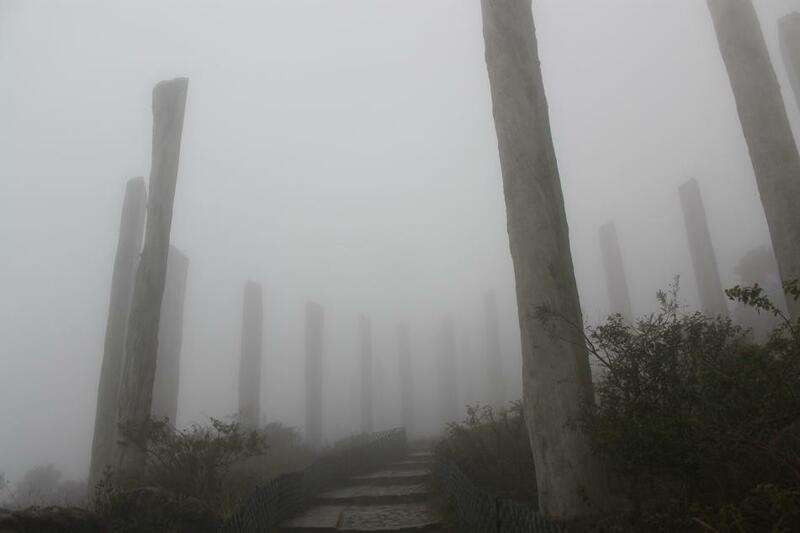 Since it was very foggy, it was quite hard to find the way to get to the Wisdom Path. But after some 15 minutes walk and some guesses, I finally found the place. The walk itself was somewhat eerie because I was the only one along the path and I totally understand why there was no one else. People could barely see in such condition! The Wisdom Path turned out to be quite nice. I like those old tree trunks which were cut into half with Chinese words of wisdom written on each half of the trunk. I also like the way they were all set up to form a crisscrossing circles of vertical tree trunks. But when the fog got even thicker, I decided to head back to the station and finally met some people who were heading to the Wisdom Path (so I think I was just a little too early to go there, hence I met nobody before). After taking the cable car back to Citygate, I went inside the mall and did something that I have never done on my previous traveling experiences: shopping! As shocking as it might sound, I did find some stuffs which actually are cheaper than in Indonesia (and they are all original, no fake items whatsoever). But I ended up buying only one t-shirt though. Strangely enough, I also met some people who work at the same company in the same office building with me (what are the odds of meeting the very same people that I meet everyday back in Jakarta, miles away in Hong Kong? very little I believe. But strange things do happen). In the afternoon I went around Kowloon and walked to the Avenue of Stars (it was still raining!). 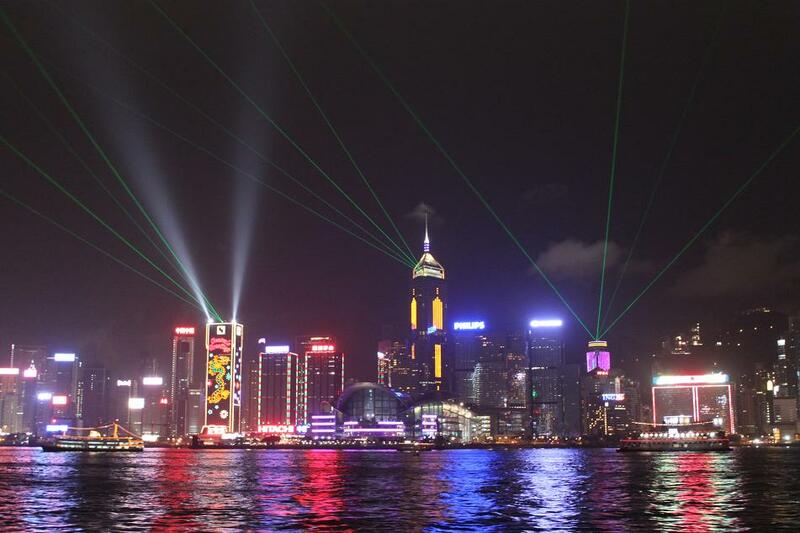 I did not spend much time there and continued walking towards a two-storey platform which in fact is the main viewing point for people to see the famous Hong Kong’s skyline and also watch A Symphony of Lights, a daily show of synchronized lights, laser and music from skyscrapers on Hong Kong Island. While waiting for the show, I was asked by a couple to take some pictures of them with a colorful boat at the background. But then it was more than just some pictures. We kept talking and the conversation lasted for probably half-an-hour. We talked about traveling, places and even religion! (I still fiund this a strange topic to talk to some strangers that I have just met). After the couple left, a guy who speaks perfect American English approached me and asked me what the couple just asked me. The guy turned out to be a nice Tibetan-Indian descendant who lives in Hong Kong but barely speaks Cantonese. Then as the day got darker (and the weather got surprisingly better), our conversation was anything but coming to an end. He bought me two bottles of cold beer while we were waiting for the show to start at 8 pm. When the show started, he told me when to just enjoy the show and when to take some photographs. Finally, at around 9 pm I decided to go back to the hostel because I had to wake up quite early the next morning to meet a friend whom I knew from the blogosphere. 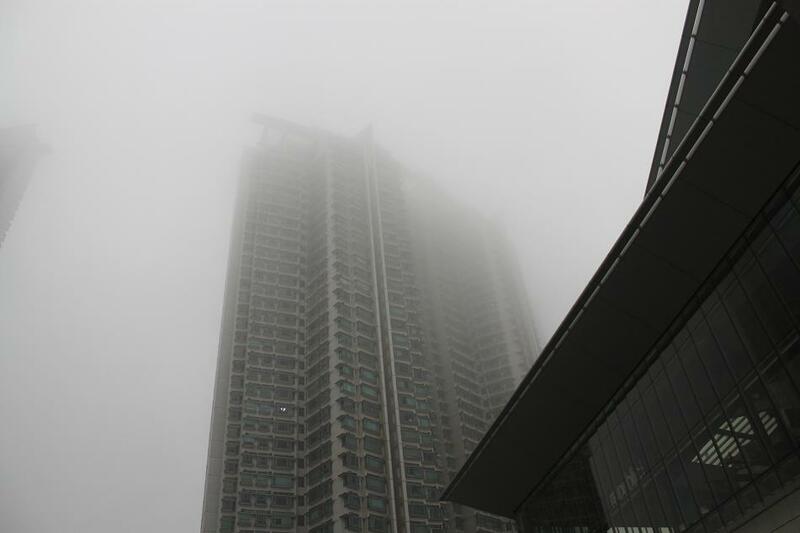 Pingback: A Very Foggy Day in Hong Kong « What an Amazing World! This is crazy – it’s sooo foggy! I still love your pictures. I only saw Hong Kong from the airport, but that was enough to make me want to go back. I’m hoping sometime soon! I know. It was the foggiest day I’ve ever had in my life. But luckily, that night things got much better. For me Hong Kong is one place that I came with low expectation but left with much anticipation for my next trip to the city. I just love it. Thanks again! I love the photographs. 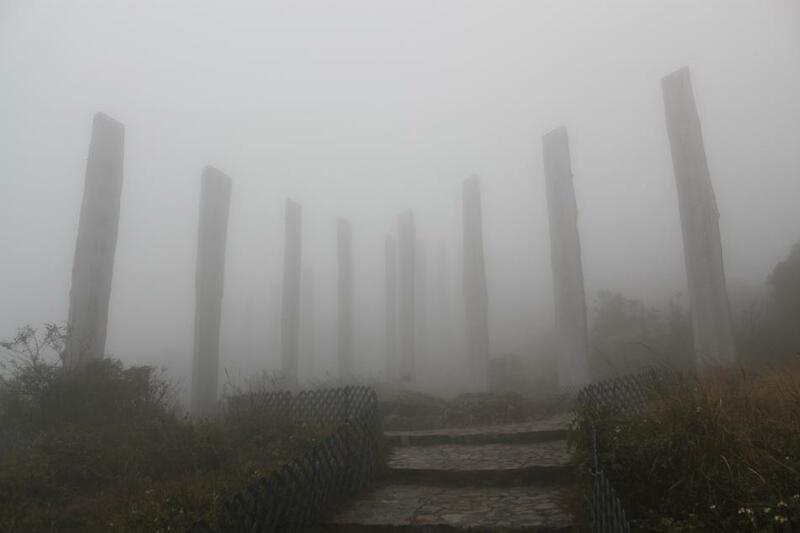 The fog brings an element of mystique and eeriness to them that wouldn’t have been present otherwise. Awesome. That’s exactly what I felt. Walking alone in such low visibility was somewhat awesome in its own way. Thanks and viva la journey too!!! Pingback: The Exploration of Hong Kong’s Alleys and Beyond « What an Amazing World! Man, that’s a lot fog! That one picture of the forest and upcoming fog even reminds me of the movie called ‘The Fog’…scary one. I also recall one day in Japan, on the island of Kyushu. We traveled all the way to see Mt. Aso, an active volcano. 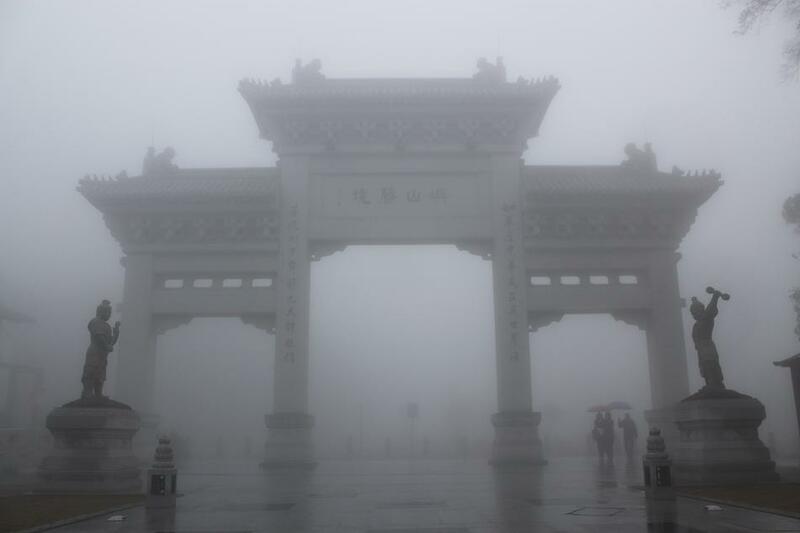 After one day of traveling we arrived, but you guess what happened: fog! The whole volcano and all the surrounding dissapeared in the fog. 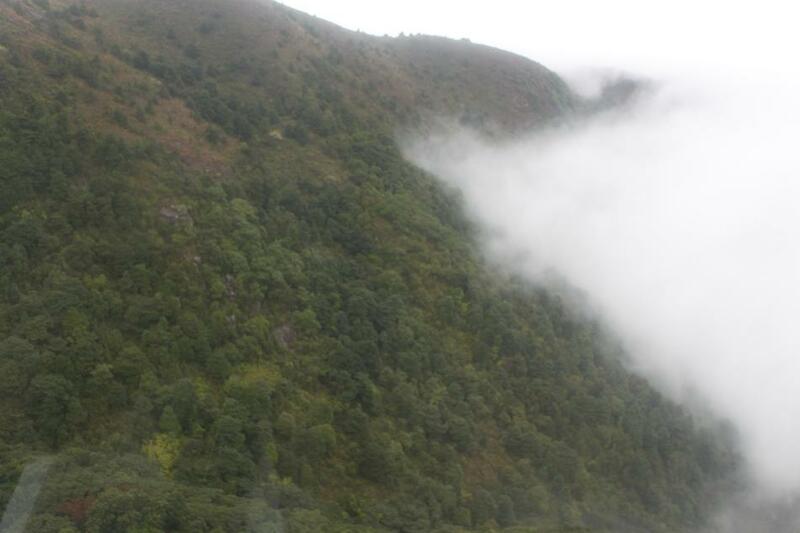 We did went up with the bus (we were the only passengers and the driver first looked at us crazy, but later on enjoyed our company), but the only thing we saw was fog….it’s a pity, because we left without ever having seen Mt. Aso. So you can totally relate to what I felt, Emiel! It’s really frustrating. But after thinking of it again, it’s actually beautiful in its own way. Here in Indonesia, there’s a hilly place not far from Jakarta which used to be famous for its morning mist. 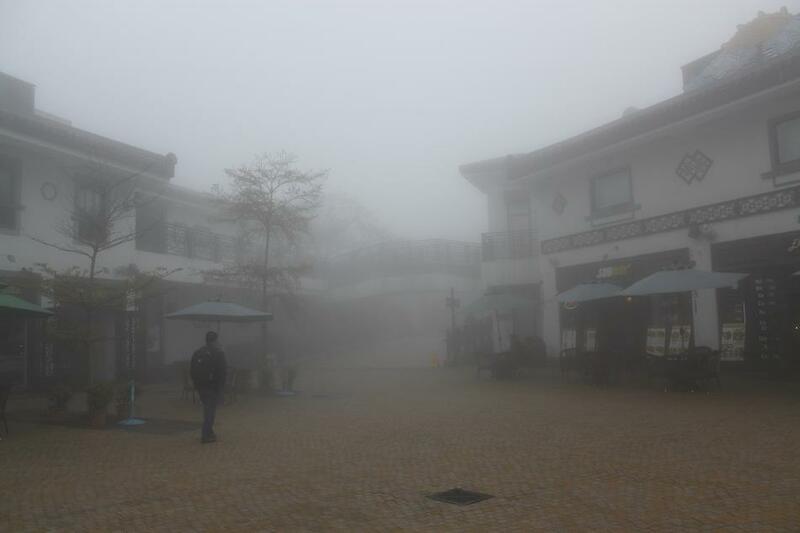 But now after mass tourism stormed the place, I don’t recall ever hearing some people mention about the mist anymore. Yours are the first posts I have read and looked at. I was captivated by the name of the site, What An Amazing World, so I decided to join and check it out. I love your photos and comments. Years ago, after wasting a day complaining about the rain while on a trip, I had this kind of a “be here now” epiphany and realized that I was still in the place I wanted to be, and they have rain there sometimes! So I really appreciate that you kept on in the fog, and shared these beautiful mysterious fog photos, and all, with us. I’ve enjoyed this whole HK series. Happy trails! Keep enjoying this amazing world. Thank you so much for reading my HK series (there are still a few more posts coming actually). I completely agree with you about the “be here now”. I was frustrated in the beginning, but later after I looked at my photographs it was kind of beautiful in its own way. 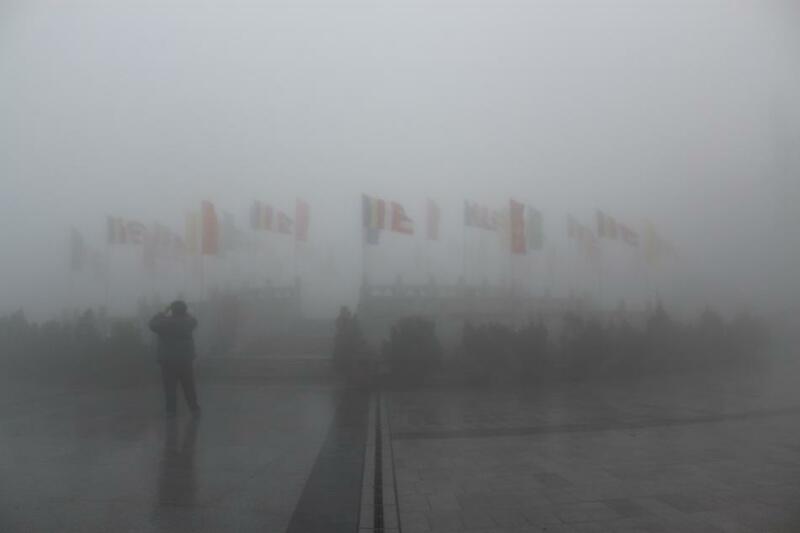 It’s such a shame that the fog lingered so long – but I think you did a great job capturing the atmosphere of the place. 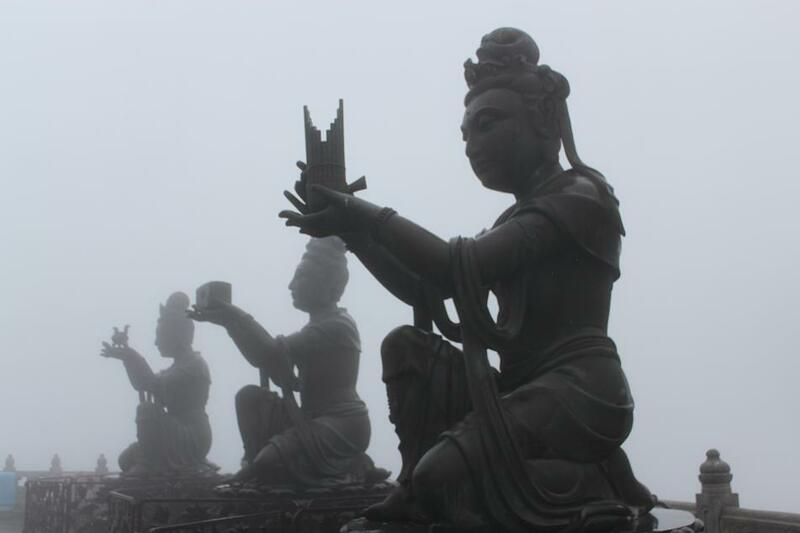 I love the setting of the smaller statues that surround the Giant Buddha and along the Wisdom Path. 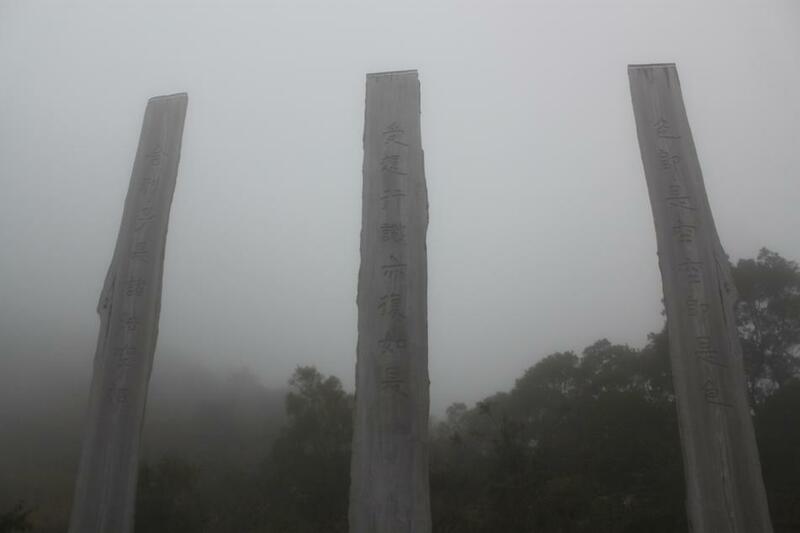 If you go to Hong Kong in winter you might get a day (or two) when fog covers many parts of the island. But if you go there in summer the view will be much nicer but there are chances for typhoon to hit the island. Thanks for reading, Lu! Ha! Somehow I knew you were from Hong Kong! Oh the fog did create a unique ambiance, but one day I’ll come back when it’s sunny. Hmmm…how did you know I am from HK? What gave that away? I live in SoCal now though. I am spending the rest of this year and half of next year though so going to try and travel around Asia more while I am here. Take advantage. I am off to Chiang Mai end of the month. Oh wow, I’ve been wanting to go to Chiang Mai for years! I hope you’ll have a great time there! Pingback: Kicking Off the Year of the Horse | What an Amazing World!